Ancient, highly valuable forests are being lost at an "unprecedented" rate from protected lands in Cambodia, according to a new report. The analysis, from campaign group Forest Trends, says that large corporations are using legitimate development permits to illegally clear land. Around 2,000 sq km of forests are being lost every year, they say. Effective governance of the forests in Cambodia has broken down, they argue. 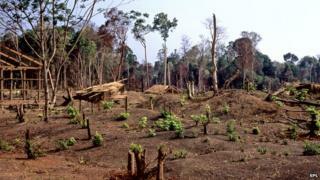 Forests have long been a big issue of concern in Cambodia and across south east Asia. In the 1990s, timber concessions were granted by the government and a rapid deforestation ensued, so much so that by 2005 the country had the third highest rate in the world. Protests from the international community forced the Cambodian government to act and logging permits were significantly restricted. But environmental campaigners say that the felling of trees in large numbers has continued by different means. In their latest report, Forest Trends say that the government has in recent years granted what are termed Economic Land Concessions (ELC) to large agri-business companies who want to develop the land. Under the guise of creating a rubber plantation for instance, the trees are cleared and exported. On many occasions the plantations never materialise. According to the study around 14% of Cambodia has been allocated to domestic and foreign corporations for development. Around 80% of that land is in protected parks and forests. The report says that about 1.1 million hectares of concession areas were awarded to purported rubber plantations, compared with 150,000 for sugar and about 100,000 for pulp and paper. "This is illegal by Cambodia's own laws and regulations," Kerstin Canby from Forest Trends told BBC News. "If my interests are just to get the timber out, I would go to the Ministry of Agriculture get an ELC and clear cut the entire forest and then I can state that I am going to plant something, but who's going to punish me if I don't?" The researchers have used data from the government along with images of over 32,000 forest fires from Nasa satellites in 2012-13. This showed that carbon emissions from evergreen forests cut down in concession areas are almost ten times greater than those outside, confirming that it is the oldest and most valuable trees that are being targeted. The authors say that most of the timber is exported to Vietnam and China - some of it may end up being sold to other parts of the world. "We are basically setting up these 'cancer cells' in the best forest areas and this is getting out of hand, the whole rule of law in the sector is melting away," Marcus Hardtke, an expert on forest issues in Cambodia told BBC News. "What happens is that the companies set up sawmills within the concession areas, but they basically go outside and grab everything and buy from other areas, they bring it into the concession and they launder it via the concession - this can go on for 2 or 3 years, they clean out the whole area." As part of global climate talks, the UN has been promoting the idea of REDD+, the reduction of emissions from deforestation and forest degradation. Under this programme developing countries, like Cambodia, can get financial support from donors to keep their forests and the carbon they store, intact. But the REDD+ programme is seen as ineffective in preventing the corruption and lack of legal capacity that Forest Trends say is widespread in Cambodia. "They have websites and newsletters but it is all irrelevant," said Marcus Hardtke. "The house is burning but they are discussing the colour of the curtains."